Here’s Jon lopping brush on the Easton Ridge trail. As I’ve noted before, trails that go through clearcuts offer years of maintenance opportunities. The single stem of wild cherry or hazel that we cut this year responds by sending out seven sprouts next year, much like the mythical Hydra. 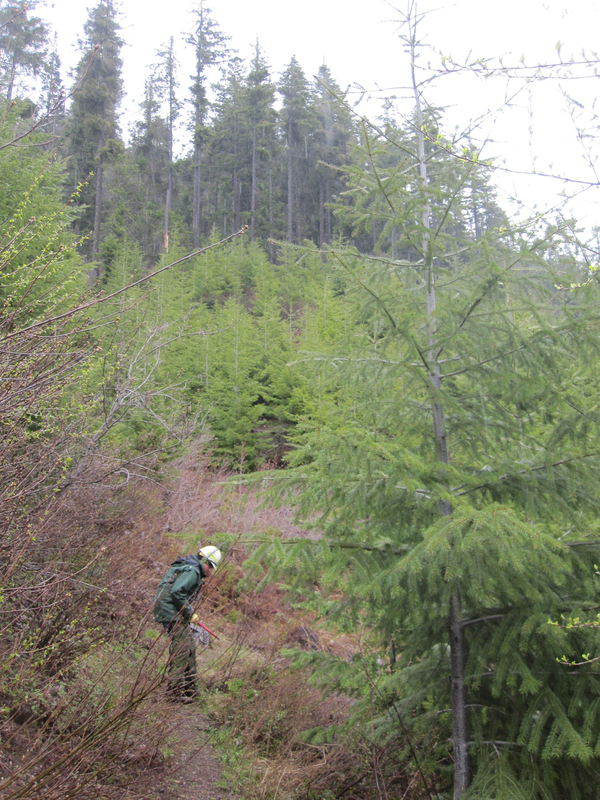 Clearcuts allow ample sun and water to reach these fast-growing plants. There will be brush to cut long after Jon and I have retired and returned to the soil ourselves. Kind of a comforting thought, so we approach the work with a Zen-like attention. The work is not futile, but it is impermanent. The day was silver. Lake Easton and Lake Kachess reflected the rain clouds back toward the sky, and the forest slopes absorbed the light. Squalls came down the valleys on gusts of wind, enveloping us in dampness. Is this rain, snow, or hail? A fine November day, Jon observed. Above us, along the ridge, ravens played all day. Their croaks and squawks were calls and laughter to each other. They sailed, wings tucked, tails constantly adjusting to the unpredictable wind. Across the valley, two creamy-colored mountain goats browsed a steep slope. I wondered what they were finding to eat. Must have been succulent, because they were intent. All day we heard the reports coming over the radio from the south. Bridge gone, road caving in, can’t get past the flood waters. Big mess. When our work was finished, we hiked down, hoping that the bridge we’d crossed in the morning was still there in the afternoon. It was. Shaking from the thunder of high water, and slick from spray, it was still there and we crossed over.